In the latest edition of the News in Cartoons Humor Times FREE app, titled, Christmas Wishes: A restless country asks for a lump of coal… to be removed,” the world’s greatest editorial cartoonists (who populate our popular Humor Times magazine with great material every single month) review the latest news in the way only political cartoonists can. See recent archives of the app on the website here. To see the most recent five editions, however, you’ll need to get the app! 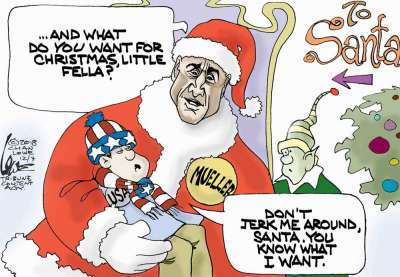 Even without seeing all the evidence, the information trickling out of the Mueller investigation seems to be leading to a “HUUUGE” lump of coal for the president, and a bright shiny gift for the vast majority of Americans, so tired of this petulant, egocentric, bumbling White House resident, installed into office with a lot of help from his boss-friend in Russia. 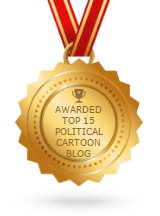 The News in Cartoons app also features a “bonus cartoon” each issue, as well as a funny video of the week — this week’s short being a hilarious scene from the awesome The President Show on Comedy Central.